get a pot of water and a steamer ready.cut squash in half lengthwise and cut into 1/2 inch slices. steam until tender. add kale and steam just until dark green, only a couple minutes. cut kale off the stems and chop roughly. Heat oil in pot and saute the ginger garlic and white parts of the scallion. cook for a few minutes then add tofu and brown slightly. add broth and kombu and a bit of roasted sichuan powder and bring to a boil then simmer until ready to serve. cook soba and divide between two bowls. 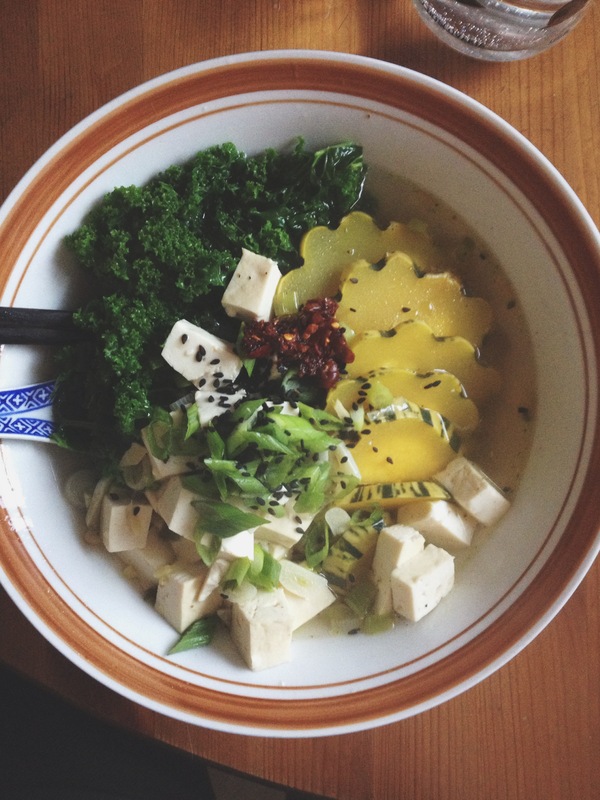 divide squash, kale tofu and broth (discard kombu). top with scallion greens, sesame seeds and chili oil to taste!